John Taylor won his first cap for Wales at the age of 21 and played 26 Tests during the golden era of Welsh rugby. He also toured with the Lions twice, in 1968 and again in 1971, when he played in all four Tests as they beat the All Blacks to record the Lions' only series victory in New Zealand. 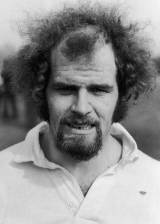 He was born on 21 July, 1946 in Watford and played for London Welsh. Possibly his most important match for Wales was a Five Nations game against Scotland in 1971 in ehich he kicked a touchline conversion to secure a dramatic 19-18 win after regular goalkicker Barry John was injured. He retired from playing in 1978 and began a successful career in broadcasting and journalism and has been a regular contributor to Scrum.com since 1999.